Advocating for Change: Claire Oliveros Honored Among 100 Most Influential Filipinas in the U.S.
“It was in my early schooling where I felt most stereotyped and impacted by race, class, and gender, which wasn’t that long ago,” says Claire Oliveros, founder of the Portland Committee of Human Rights in the Philippines and Multicultural Director for Portland Community College, Sylvania Campus. Claire, a Portland native, speaks candidly about how her experiences growing up biracial in a predominantly white city have impacted her life and career path. 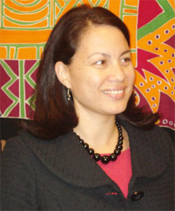 For her work in raising awareness about human rights violations in the Philippines and contributions to promoting diversity at PCC, Claire was named among 100 Most Influential Filipinas in the U.S. by Filipina Women’s Network, a national organization that aims to enhance public perceptions of Filipina women. By highlighting the capacity of Filipinas to lead, the group seeks to change biases against the leadership abilities of Filipina women and promote the entry of Filipinas into positions of leadership in corporate, government, and nonprofit sectors. Colors of Influence caught up with Claire to talk about the award, Portland CHRP, and her work at PCC. You were recognized by the Filipina Women’s Network for your work at PCC and establishing the PCHRP. What is your mission and vision for the PCHRP? Portland Committee for Human Rights in the Philippines (Portland CHRP) is a Portland-based organizing committee of Filipinos and allies working in solidarity to advance the national democratic movement of the Philippines in the U.S. Portland CHRP serves as an outlet for local, national, and international action alerts, media updates, and general information related to human rights violations against Filipinos in the Philippines and the U.S.
Portland CHRP is a member of BAYAN-USA. BAYAN-USA is an alliance of progressive Filipino groups in the U.S. representing organizations of students, scholars, women, workers, and youth. As the only international chapter of Bagong Alyansang Makabayan (BAYAN-Philippines), BAYAN-USA serves as an information bureau for the national democratic movement of the Philippines and as a campaign center for anti-imperialist Filipinos in the U.S.
Portland CHRP is a young organizing committee, just two years old. PCHRP formed when I returned from the International Solidarity Mission (ISM), a fact-finding mission convened by several national democratic organizations including Karapatan, the Alliance of Human Rights in the Philippines. The main objective of the ISM in 2005 was to visit the sites where human rights violations occurred. We collected stories from the family members of the victims of the November 2004 Hacienda Luisita mill workers and farm workers strike massacre where seven strikers were killed during a violent dispersal of the strikers. Since 2005, we’ve organized events and programs designed to raise awareness about the worsening human rights conditions in the Philippines, and link them to our conditions as Filipinos in the U.S. In November, we commemorated the Hacienda Luisita strike by showing a film series at PCC Sylvania and at PSU to help generate awareness and support to stop the killings in the Philippines. Why is it important to bring these issues to the surface? The Philippines is my family’s homeland. I care because it’s my cultural heritage and ancestry, identifying as a Filipina in the U.S. I feel like our experience as Filipinos in the U.S. is directly related to the colonial history between the Philippines and the United States. We have an entangled history. Currently, the Philippines is a neo-colony of the United States. Filipinos are forced to look for jobs overseas, separating families over three to five continents at a time. It’s important to talk about these issues because Filipino communities in the U.S., in the Philippines and countries around the world are directly affected by poverty, violence and war in the name of capitalism and greed to serve the interests of the United States. Because I live here in the United States, I feel that it’s important for me to resist that as the status quo. Filipinos are not expendable. It’s not OK to exploit wage labor, and it’s not OK to brutally massacre people. We have resources in this country to resist and speak out against GMA and U.S. political oppression so we can see victory for Filipino people in the Philippines. My family on my father’s side believed that coming to the United States would improve their social conditions. Maybe materialistically, they have more than what they did in the Philippines, it’s a struggle. It’s a check-to-check struggle, working low-wage, low-skilled jobs. Filipinos shouldn’t have to leave our own land for a job, when we have highly skilled people in the Philippines. We have enormous amounts of natural resources that are being stripped and grabbed by multinational corporations so that the 1% of world’s population can continue to control 90% of the world’s wealth. I have seen my family and our community suffer. I experienced separation and loss because my family was displaced. Growing up with a single working mother in Portland, a predominantly white city, I’ve experienced class and race struggle. Everyone is doing the best they can with the resources available. Systems of institutional oppression uphold these conditions. It’s really important to deconstruct the complexities of the institution and direct our energy at resisting the system and its impact on the people within it. What accomplishments of the PCHRP make you most proud? The collective is committed to investigating and understanding the roots causes of poverty in the Philippines and makes the link to the conditions of Filipinos here in the U.S. We are strategic in our actions and how we do our work together. We come together to critically study the issues. We participate in actions in defense of immigrants who are being intimidated and detained by ICE. Portland CHRP exists so Filipinos, Filipino Americans, and allies can come together to critically discuss conditions of Filipinos here in the U.S. The Philippines has a long history of revolutionary struggle. Now, we see the state use the Philippine military as an apparatus to squelch anyone who speaks out against the government. We’re willing to talk about these issues and hold governments accountable for political repression. We highlight three significant events in Philippine revolutionary history. These events include September 21 Commemoration of the Anniversary of Philippine Martial Law, the Commemoration of the Hacienda Luisita Martyrs, and International Human Rights Day on December 10. On Nov 13 and 14th, PCHRP hosted two film showings to commemorate the Third Anniversary of the HL strike massacre. The films were shown at PCC and PSU. The films are “Sa Ngalan ng Tubo” (In the name of Sugar…) and Aklasan! Strike! These films chronicle the events leading up to the violent dispersal of the picket line outside of the Cojuangco Sugar Factory in Hacienda Luisita in Tarlac, Philippines. What are some of your top challenges in working toward your goals for PCHRP? Right now we are in the “awareness” stage of organizing our community around these issues. We have the capacity to host events, activities, study sessions, and participate in a few community-organized actions but we also have limitations in our work as well. Some of the challenges we experience are related to the capacity to build a mass organization as volunteers. We are students, youth, and workers with full time jobs, so we have limitations to doing this work in our community. So a strategy that works for us is to integrate our issues into the day-to-day work we are involved in within the community college setting, university, and other organizations we are involved with. This technique allows us to continue our analysis and bring others on board to the work of PCHRP and the national democratic movement of the Philippines. Why are you drawn to work that advocates for communities of color, particularly the Filipino community? For me the personal is political. Growing up in Portland I often was the only Filipina in school and found myself defending myself based on identity; the way I looked or where I was from. I often was asked growing up “What are you?” or “Where are you from?” and if my answers were not to their satisfaction I would be asked, “No where are you originally from?” I recognize that many of us experience forms of oppression. It’s important to find points of unity to organize around interrupting and eradicating all forms of oppression . It is challenging because there is not a shared analysis to help us frame the issues and see ways that we can fight institutional oppression together. It was in my early schooling where I felt most stereotyped and impacted by race, class, and gender, which wasn’t that long ago. Not much has changed for youth and students in the system of education. I know that immigrant youth and youth of color are impacted by institutional racism, discrimination, and stereotypes. I first became involved in college organizing with students of color on anti-affirmative action policies at the college I was attending. I attended a predominantly white small liberal arts college in western Oregon. After college I moved back to Portland and became involved in Filipino local and national organizations. Because of my racial heritage and ancestry to the homeland I care about issues impacting Filipinos in the Philippines, U.S. and abroad. I also believe the Philippines revolutionary struggle is a model for us to follow in combating imperialism, bureaucrat capitalism, and semi-feudalism. What is your primary charge as Multicultural Director for PCC? To provide advocacy, leadership, and direction for the programs and services for students of color and immigrant students attending PCC. The Sylvania campus enrolls about nearly 20,000 students with a population of about 19% students of color. The MC is a retention program for students of color. I serve students as an academic advisor and supervise the student leaders of the Multicultural Leadership Training Program (MTP) a yearlong retention program for the student staff of the Center. The MC is committed to the advancement of students of color through the MLTP, which recruits, trains, and retains an aggregate of 10 students of color through the MLTP. The MLTP includes a 60-hour anti-oppression training before Fall term to prepare students for their positions. Throughout the year students provide direct service, campus referrals, and create programs, events, and activities to raise awareness of issues of racism and other forms of oppression. Student leaders work in the Center as Peer Tutors tutoring math and science courses and as Student Coordinators developing programs and events through the Center. Essentially, the student leaders are trained to direct and operate the programs and services of the Center. In your role at PCC, how do you measure success? Success looks different for each student and program. In the Center one way to measure success is when a student completes their personal and academic goals. I believe reflection is critical to one’s progress. I try to tie in theory, practice, and reflection to our practice in the center. I don’t think organizations or individuals allow for the space and time to reflect and learn from our work. I believe it is also important to find a balance with action and reflection. In this culture we are assessed based on our outcomes or action, so it is necessary for the Center to participate in assessment activities that examine the ways in which we serve students and how often we are serving students. What is the personal significance of the 100 Most Influential Filipina award? I think the award raises awareness of the impact Filipina women have on U.S. culture and society. I’m extremely honored and privileged to be a recipient in the “Emerging Builders and Leaders” category. The award says a great deal about the value of Filipinas in leadership throughout the country. One hundred women were awarded but there are hundreds and thousands of Filipina women doing great work in the U.S. and Philippines that are deserving of this award who do this work without public recognition. It’s a g reat honor to be nominated by a wonderful friend and colleague Carmen Caballero Rubio from Mayor Tom Potter’s office in the City of Portland. Portland Community College’s Dean of Students and Staff Development were very supportive in helping pull together funding so I can attend the ceremony in Washington D.C.
"I feel like our experience as Filipinos in the U.S. is directly related to the colonial history between the Philippines and the United States. We have an entangled history." "I have seen my family and our community suffer. I experienced separation and loss because my family was displaced." "The Philippines has a long history of revolutionary struggle. Now, we see the state use the Philippine military as an apparatus to squelch anyone who speaks out against the government."